I was sitting on the edge of an exam table in a doctor’s office, wearing a little cotton johnny and my bare feet cold against the stainless steel. I held my breath and waited for the doctor to come in. I was nervous. About a month earlier I had the feeling that I needed to see my dermatologist. It started as a little voice that said “You should call and get a body check.” I ignored it. The voice got louder until I had no choice so I picked up the phone and made an appointment for the first available slot 3 weeks away. Still I couldn’t shake the feeling that something was wrong. I broke down and called last week and said “Look, I feel like something is wrong. Can you get me in any earlier?” Luckily, the receptionist took pity on me and got me in on Monday. I just couldn’t shake the feeling that something was very wrong. Dr. Kim came in. I love her. The appointment was going well. 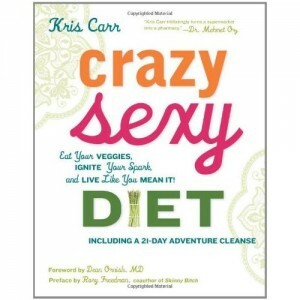 Dr. Kim congratulated me on my weight loss and wished me luck on my quest to be a mom. We were laughing as she looked over my body from head to toe. I stopped worrying until she got to a point on my back when she said to the technician “We’re taking this off.” I started to sweat. I felt my face get red. My heart started beating fast. I felt so hot like I was going to throw up. “How how bad is it?” I asked. “I am a worrier by nature,” I said. “I know,” Dr. Kim said as she numbed the area and started cutting. I started praying the Hail Mary once, twice, four times. She told me the pathology results would be ready in a week. I wondered how I could wait a week for the results. I don’t remember driving home. I called my husband to tell him they found something weird. I called Kay, the lovely woman in charge of the prayer chain at my church. I called Sr. Mary Magdalene at a convent in my hometown in Massachusetts. I asked them to pray for me, to pray that the pathology would be negative. I got the call just a few hours ago. In the moment between seeing Dr. Kim’s number pop up on my cell phone and hearing her voice, time stopped. I remember thinking “This is weird how time is going so slow” and I realized my life as I knew it could change in just seconds. “OK,” I said. We scheduled surgery for next Tuesday. I worry. It is what I do. I don’t want to be this way but I am. I obsess and I know I will obsess until Tuesday afternoon, until she tells me I am OK and there is nothing to worry about. I hung up with her and I tried to remember everything she said to me. I tried calling my husband but I just stared at the screen on my phone. I couldn’t remember his number. I couldn’t remember his name. I just kept thinking that I prayed so hard and I wanted it to be nothing but yet here I was scheduled for surgery next week. 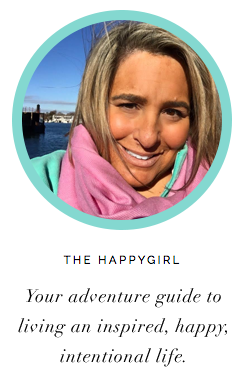 This past week I started thinking about this blog, the Happy Girl Experiment. I know I haven’t written lately and it’s because I have been depressed. The weather here in Seattle is miserable. It has been roughly two months of cold, rain and gloom. In fact last night it was 36 degrees and hailing. I like the sun (which I am paying for now), I like being outdoors. I don’t do well in rain/ mist / drizzle/ grey skies. Eight weeks ago we lost our babies. Six weeks ago I pulled a tendon in my left foot and was put on the sidelines by my doctor so I could heal. No more running. I have been inside alone, sad, feeling sorry for myself, feeling like a failure that I am not a mom, watching the rain outside being completely unmotivated by anything. I spent last week researching melanoma. I became submerged in this deadly disease. I read about a beautiful 20 year old girl who found a freckle on her leg and died 6 months later. I looked at hundreds of pictures of melanoma. I read the stories of hundreds of people who were diagnosed with skin cancer. Some won their fight, some lost. I cried as I read every story. I thought of the hundreds of days I spent lying in the sun from childhood through adulthood. Of all the times I eschewed sunblock, of the dozens of sunburns I wore like a badge of honor. I got out my box of high school and college pictures and in every one of them I am tan, from thousands of hours in tanning beds and laying by pools every vacation. I wondered if I was going to be one of these stories. Did I deserve skin cancer because of my reckless behavior? I am lucky. I do not have cancer. But I came thisclose. I believe that if I didn’t listen to that little voice inside me and made that appointment that I would indeed have developed skin cancer, in six months, a year, 5 years. I sat in church this morning after the call from Dr. Kim. I was very lucky that I caught these wonky cells in time. Sitting in the quiet of the church I felt like I was in a moment of such clarity. I am making changes. I am embracing my life. I am not wasting a single moment being depressed because the weather is bad, because I don’t have a baby, because my job was eliminated. I have my health. It’s easy to take your health for granted. You go about your life eating an Egg McMuffin, driving to work, sitting through another dull meeting, reading/responding to emails after dinner instead of spending time with your kids or your partner or your dog. I was reading something earlier this week that shook me to my core. 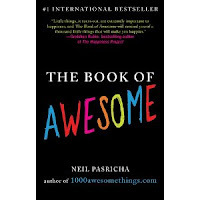 I bought a book called “The Book of Awesome” and in one of the final chapters the author says that in 100 years everyone around you will be dead. You. Your husband. Your dog. Your baby. Your best friend. Everybody. That shocked me to my core. Life is short, fleeting. I never really thought that until this week when I thought my life could be cut short. I am over feeling sorry for myself and wasting days because it is raining out, because I feel sad. By the grace of God, I caught a reprieve. 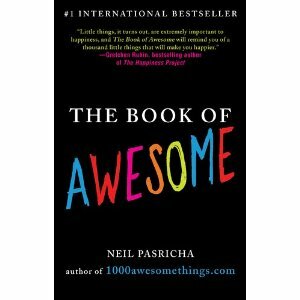 I am a lucky girl and I am about to change my life. I hope you haven’t had a close call like this. I hope you never will but I feel so strongly about what happened to me this week that I have to share this with you. I hope that this encourages you to take the Happy Girl path, to embrace this unimaginably good life. Every single day is a gift to each one of us. Every single day should be cherished. Every single day is amazing. Here are some of the changes I am making now that I know that life is unforgivably short. 1.) Have a full skin check every year. I already made my appointment for 9am April 5, 2012. If you have never had a dermatologist look you over head to toe, make your appointment now. Melanoma can be lying in a freckle the size of a head of a pin. You can’t diagnose yourself. I couldn’t. Save your life. Go ahead. I’ll wait. Click here to find a dermatologist in your area. 2.) Have a full physical every year. If you don’t have your health, you can’t focus on anything else. Seriously nothing else matters. Make sure your heart is healthy, your blood pressure in check. Go make that physical appointment now. 3.) Follow your gut instinct. I knew something wasn’t right. That little voice is never wrong. NEVER. If you feel like there is something wrong, make a call, follow up, whatever that instinct tells you to do whether it’s to call your kids and check where they are or to bring a cupcake to your elderly mom or grandpa. The night my grandfather (and favorite person in the world) died I was going out with my friends on a Friday night. I kept thinking of my Pepe all afternoon and before I went out with my friends on that January night of my freshman year in college I went over to my grandparents to tell them I loved them. I got the call from my grandmother at 1am that night telling me my grandfather had died unexpectedly. I ALWAYS listen to my instinct. ALWAYS. Trust your instinct. You will never be wrong. If you feel weird about the babysitter or the guy on your doorstep selling magazine subscriptions or your tiny insignificant mole act on it. 2.) Change your diet. The right nutrition can change your life. Kathy Freston’s new book “Veganist” is also phenomenal. 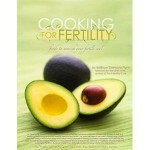 Another great book is Kathryn Flynn’s new cookbook “Cooking for Fertility” which is not just about help getting pregnant but decreasing inflammation in your body. These three books are my new cookbook bibles. I have never liked moving. I don’t like sweating but last June I started walking. I barely walked down my little street before I had to stop for a break. In six months I was up to running 5 miles a day. Now that I have been grounded by my doctor I need to try something else. With my obsessive personality I realized I needed to chill my head. I just bought Yoga and Qi-Gong DVD’s and I am looking forward to relaxing and getting in tune with my body for an hour a day. I know what you’re thinking. You have no time, right? Kids, work, dinner, etc. No time. Make the time. Wake up an hour earlier, lace up your running shoes. Walk 1/2 a mile, try yoga, go for a bike ride with your kids. Move your body. Your lymph nodes drain the bad stuff from your body. Help your body along by moving all the sludge sitting around in your tummy, in your cells. 4.) Get out of your own head. Do something for someone else. I think about myself all the time. Me. Me. Me. Why don’t “I” have a baby? “I” am so annoyed with this weather. “I” miss my great job and “I” am a loser. During this week when I couldn’t stop thinking about my prognosis I called Kay from the prayer chain and asked if there was anything I could do to help someone else. She referred me to another woman in the church and I spoke with her a couple days ago. Tomorrow I am visiting a woman who is homebound and needs visitors. I’m also on deck to cook meals for parishioners who might need some TLC. There are four people in our church alone who lost a spouse this past month. My goal in the next four weeks is to bring dinner to each one of them to let them know that they are still in our minds. 5.) Live your life today. Don’t put anything off. Always wanted to see Hawaii? Want to have a baby? Take a letterpress class? Have you put away your good wedding china for special occasions? Are you waiting to go on vacation until you lose the weight? Life is so short. Start living your life right now. Every year on my grandmother’s birthday and Christmas my mother would give my grandmother soft flannel nightgowns with matching robes and slippers. She refused to wear them. Instead she wrapped them in tissue paper and stored them in her closet for someday. “Jacqueline," she said "I will wear them when I go in the hospital.” My grandmother never wore these nightgowns. After she died we were cleaning out her closet and found these soft flannels with their tags still on them. And me? I took after my grandmother. I did the same thing. I had such an exciting job traveling the world that I put off even thinking of having a baby for 11 years. How could I have a baby when I was in Australia chasing an interview. If I could do it again I would give up every moment of fun I had on five different continents and I would have focused more on having a family. Book that trip to Hawaii. Make a baby. Serve your Chicken Milanese on your wedding china. Wear your flannel jammies. It’s rare that people tell someone how they feel. It’s all about “See ya,” email, Tweets, texts. When was the last time you received a handwritten letter? Have you ever told a friend you loved her? I know it seems weird but try it. Maybe you’ve been married for ten years. You’ve got a great partner and a couple kids. Life is busy. Think back though. Do you remember the last time you looked into your husband’s eyes and said “I am so lucky to have you in my life. You are a good father. You are a good man. Do you have any idea how much I love you?” Life flies by so fast that it’s easy to take advantage of the people who love you. I’ve made a list of friends I love, friends and family who have been there for me. It’s a short list but it made me realize that I am lucky to have people I love and who love me back. Make your list. Then make a phone call. Every single day. Don’t lay by the pool tanning or visit a tanning salon. There is no such thing as a safe tan. I feel like I have a PhD in skin cancer from all the research I’ve done this past week. Lather it on. I like the Bullfrog brand 36 SPF surfer gel. It sinks right into your skin. Consider my scare, your scare. Jergens has a great gradual self-tanner if you must have a tan. Do this for me, OK? I love you and I want you to live a long, wonderful, healthy life. That’s what I have right now. The new Happy Girl Rules for Living. If you have any rules that you live by that you think we should live by, email me at Taylor at thehappygirl.me. Be healthy, be happy. Life is unimaginably amazing, isn’t it?